The FloPrompter product line has been discontinued effective April 2012. Compose your teleprompter scripts with the full range of rich text styles, multiple broadcast segments (scripts) per file, and extensive user customization including background colors and themes. Smooth scrolling in the teleprompter window. Import and export to and from Microsoft Word, HTML, and many other formats. FloPrompter Standard even includes a spell checker and thesaurus! **Educational pricing for students and teachers is no longer available. Enjoy all of the features of Standard plus the additional features required by video and audio recording professionals. Supports mirrored text and multiple monitors. A Master window can control one or more separate Talent windows. Enjoy additional features that are exclusive to the Professional edition, such as inserting images, setting line spacing, and more! Microsoft Windows: FloSpace FloPrompter is unlikely to run on Windows 8.0 and higher. 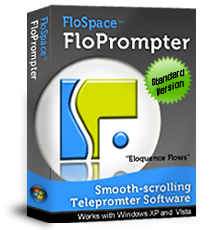 Due to recent Microsoft Windows updates, FloSpace FloPrompter also may not run on previously supported Windows versions, e.g., XP, Vista and 7. We apologize, but Microsoft's Windows updates are beyond our control. FloSpace reserves the right to change features, availability, pricing and licensing policies at any time for all products and without notice.